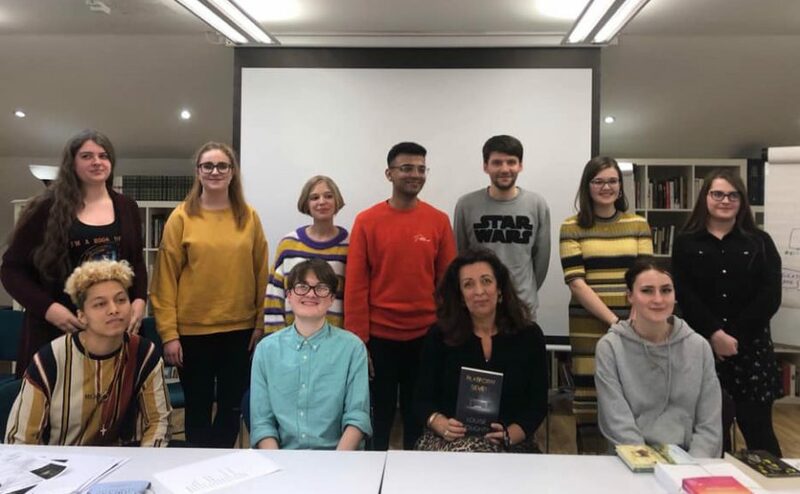 On 28 March, New Writing North accompanied 10 young people on a trip to Faber & Faber in London. In this post, one of the participants, Jawwad, talks about his experience on the day. My inbox was getting stuffed with newsletters, emails and spam like it usually does, my weekly clearing out was getting closer. Every Sunday evening, I have a ritual of clearing out my emails, separating the gold from the dust. The process is like hitting a big red refresh button before the week ahead. In the middle of my uncluttering, I found the regular New Writing North email. My eyes fell on the opportunity to go to a renowned publishing house, Faber & Faber. The house that published the likes of Sylvia Plath and Harold Pinter, and where T.S. Eliot was a founding editor. The experience of getting a full behind-the-scenes look at the process of a book from neurone to new release was very enticing. I applied without hesitation. After a quick briefing at the NWN HQ where I met the other lucky participants and was given a book that was to be published by Faber later in the year, the day was here. It was an uber early start to get to Central Station for 8.30am. Once at the station, we were hit with news that the trains were delayed. In these divided times if there’s anything that unites us at the moment, it is surely our despair at train delays. Fifteen minutes after we were meant to be on the train, we were on our steady way to London. Once in the Faber & Faber offices, we were met in the lobby by Rachel, who is the bold-trainer-wearing, cheery communications director at F&F. We had just missed the CEO who had to trek over to Westminster for a meeting (damn trains! ), but we were assured the day would parade on without any bumps. Once up in the book-adorned training room, Rachel gave us a quick lowdown of the process of books from a publisher’s perspective. Although I was expecting it to be longer than it takes for me to pick a book up from a shop, I didn’t imagine that it would take a year from finishing a novel to publishing it. A real baby is ready in nine months, a book baby takes longer! Next, we heard from the chatty editorial director, Louisa, who gave a very illuminating talk about the process of editing a book. It truly put the year into perspective. Production duo Jack and Pete came along to talk about the crafting the physicality of a book – who knew how interesting the topic of paper size and quality would be? It was intriguing to learn about the immense considerations that go into making a book. Faber’s marketing maverick, Niriksha, got us to do a fun-filled task of marketing the book that we were given; the need to think outside the box for a campaign was challenging but invigorating. The Sales department brought along cinnamon buns, and it totally helped sell their stories of travelling and almost persuaded me to sell my kidney for a job there! The day rounded off nicely with meeting the lovely Louise Doughty, whose book, Platform Seven, we had the pleasure of getting a copy of. She discussed her journey as an author, where she got inspiration for the book and her thoughts and feelings on the publishing industry. So many gems that she passed on, but the one that stood out was that perseverance is key to being an author. It wasn’t until Louise got to her sixth book that she was able to make a full-time living from it. After we got our books signed, got pictures with Louise and said our goodbyes, we took a quick walk back to King’s Cross in the dreamy, pink London sunset. As the sun was going away for the day, I was going away with a dream to have a book published one day. To hear about our latest opportunities for young people, follow us on Twitter, Facebook, Instagram or sign up to our newsletter here.